Any man described as having "the veneer of the charming, hyper-intelligent, eloquent, sly mastermind, but underneath, a kind of die hard romantic," deserves to be honored and mention in any fashion blog. Actually scratch that. They deserve to be featured in any blog. Today, we turn our attention to the fictitious style of American crime-drama, White Collar. And like I say time and time again, these posts are not here so you can just plagiarize the style of another, take bits of inspiration and create your own take on looks by incorporating it into your personal style. Convicted con-artist and now criminal consultant of the FBI, Neal Caffrey (played by the gorgeous Matt Bomer) is the breakout and central character of USA Network's crime-drama White Collar. His personal traits are reflected very well in his style, something the show's costume designer, Stephaine Maslansky, has always openly discussed. The inspiration behind the Caffrey wardrobe is very much taken from the Rat Pack era of the 40's and 50's. So naturally, names to the tune of Frank Sinatra, Dean Martin and Cary Grant are never far from being named as key influences. It's not only inspiration that has been taken from by-gone decades; the Neal Caffrey wardrobe is a mix of both vintage and contemporary pieces. Maslansky describes his look as "Mid-century gone modern". Vintage ties in particular are a main stay in Neal's wardrobe. Sourced from the famed New York thrift stores, Star Struck and Cheap Jacks, they add a certain authenticity and believability which could only ever be achieved through the elegance of genuine fifties neck-wear. These vintage ties are one of many smaller details that help to complete the Caffrey look. The ever-present pocket square and tie bar, the slight tilt of the fedora and the carefully selected colour palette (which complements Bomer's blue eyes, if I do say so myself) all ensure Neal's style is more than stand out. Fine attention to detail is, however, only half the battle. The clothes used in the styling of Caffrey are all tailored to fit absolutely perfectly; another example of just how important fit and cut are when wanting to look your best. Maslansky opted for suits with a slim silhouette for Bomer's character to bring the wardrobe (and fifties influence) into the modern day. Maslansky and Bomer have both contributed in creating and turning Neal Caffrey into a style icon. He is a great example of how style transcends simply wearing designer clothes or following trends. 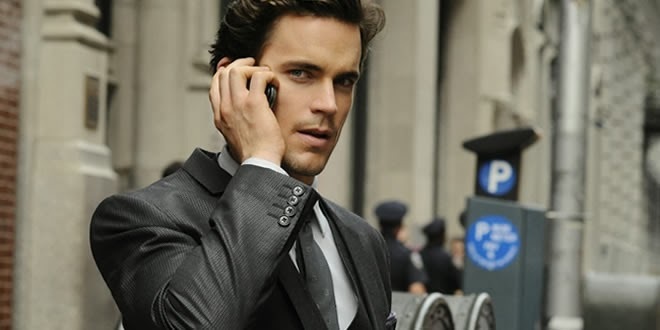 Without ducking behind the usual cliche of how important confidence is, and how you don't need to spend a fortune to look good - which by the way are both very true - Neal's real style comes from his persona and attitude, courtesy of Matt Bomer and of course the sublime fit of his clothes.